Samsung on Friday confirmed that yes, the original Galaxy S phone and Galaxy Tab tablet won't receive upgrades to the latest version of Google's Android operating system, Ice Cream Sandwich. The disappointing news seemed to be coming after Samsung announced which of its Android devices would get the Ice Cream Sandwich update on Tuesday, while leaving the popular Galaxy S and first-generation Galaxy Tab off the list. 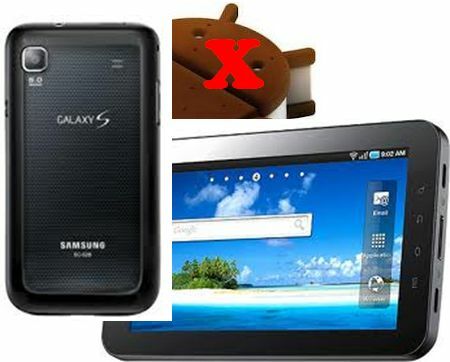 As per Samsung, the Galaxy S and Galaxy Tab won't be upgraded because the two devices lack the necessary hardware, namely not having enough RAM and ROM, to power Ice Cream Sandwich after Samsung puts its TouchWiz user interface changes over the top of the software.